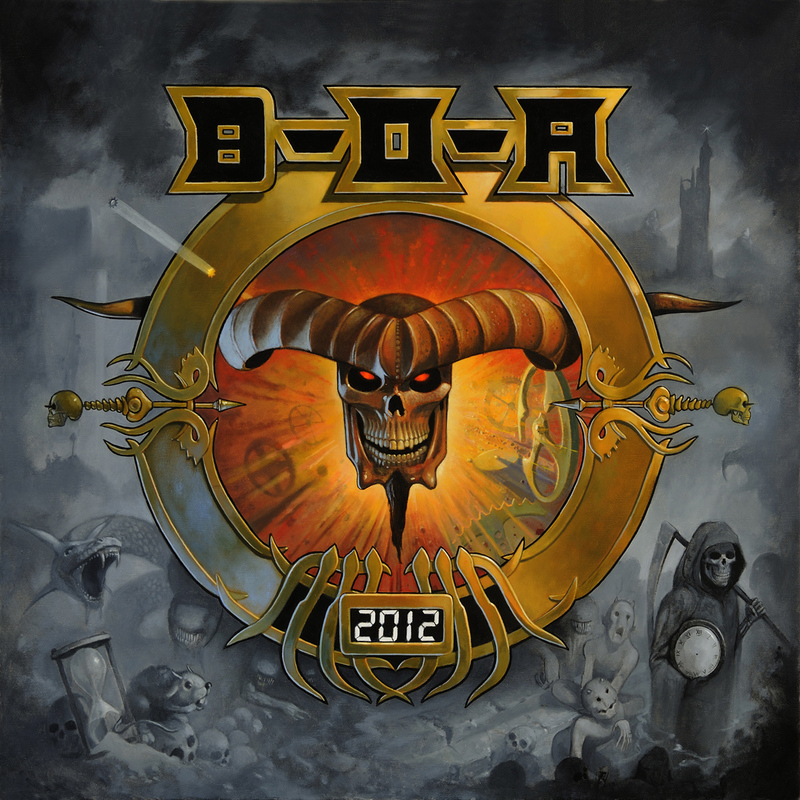 Bigger, better and louder than ever, Bloodstock Open Air turned 2012 into a true rock apocalypse! Around 11,500 metal maniacs invaded the beer-soaked battlegrounds of Catton Hall for yet another long weekend of music, merriment and great memories. The phenomenal attendance figure is the largest yet, showing Bloodstock continuing to grow year on year without sacrificing an ounce of the passion and integrity that makes it the UK’s number one metal festival. Of the newcomers joining in the fun with the Bloodstock faithful, the vast majority were here through word of mouth recommendations, a heartening testament (no pun intended) to people power and the underlying strength of the UK metal scene. And as always, we welcomed an even larger contingent of fans from all corners of the globe, many making the pilgrimage for the very first time. We wouldn’t be truly British if we didn’t mention the weather, but suffice to say that the Sky Gods mostly spared us their wrath, with just a few showers sprinkled over an otherwise warm and (sometimes) sunny weekend. As is now the tradition, the festival kicked off on the Thursday night with the Sophie Stage rocked to the ground by amazing warm-up sets from Saturnian, Bloodshot Dawn , Marionette and the mighty Viking Skull. As a way to get the party started, it was perfect. Friday’s main stage festivities kicked off in style with Reading newcomers Malefice, and from then on in, it was quality all the way. Ten years absent from the Bloodstock stage, German power metallers Freedom Call returned to prove that age has not wearied them, and there were repeat visits too from Sweden’s Grand Magus and epic heathen metallers Moonsorrow. The other main stage highlights were too many to mention, but special shout outs should go to Watain who caused mayhem on stage (and, by all accounts, vast destruction at their hotel afterwards), and headliners Behemoth. The band had originally been scheduled to play Bloodstock 2010 but were forced to cancel when frontman Adam ‘Nergal’ Darski was diagnosed with leukemia. Fortunately, he made a complete recovery, and Behemoth’s triumphant set will rightly be remembered as one of the most outstanding Bloodstock performances to date. Saturday’s main stage action exploded into life as Birmingham death metal veterans Benediction made their third visit to Bloodstock, followed in rapid succession by stellar sets from I Am I, Cthonic, Crowbar, Mayhem, Sanctuary and Hatebreed, the latter tearing up the place like there truly was no tomorrow. Thrash titans Testament were up next, pumping out classics with the enthusiasm and energy of guys half their age. It then fell to Oakland bruisers Machine Head to crown the day with what was a masterful exercise in pure metal and spectacular showmanship. If Behemoth had brought a ton of pyrotechnics with them, Robb Flynn’s boys had carted in the entire pyro factory! Come Sunday morning, thousands of us were up to our necks in beer (proper quality stuff mind, this is Bloodstock! ), burgers and bruises, but there was no time to back off from the merrymaking as main stage openers Kobra And The Lotus reminded us. Huddersfield thrashers Evile followed, making no less than their fourth Bloodstock appearance and what a show it was. Crowd surfing on a Li-Lo was just one highlight! The afternoon and early evening witnessed star turns from a string of top names including death metal doyens Nile (complete with a brief but nonetheless Biblical downpour! ), face-melting Michigan quintet The Black Dahlia Murder, old school heroes Anvil, UK gloom merchants Paradise Lost and Norwegian black metal machine Dimmu Borgir. Some new to Bloodstock, some not, but all did themselves and us proud. It remained, however, for shock rock king Alice Cooper to show the rest of us how to really take control of a crowd. In a performance that smashed straight into the annals of Bloodstock legend, Alice dished out a lesson in stagecraft and pure entertainment which explained why he’s still a rock star to end them all. The rest of the weekend’s Sophie Stage events were littered with highlights, the likes of Winterfylleth, Pythia and Eastern Front keeping heads banging until French dark metallers Alcest finally rounded off Friday with a bang. Saturday’s Sophie action was, if anything, even more exciting, an incredible showing from our very own Orange Goblin bringing a party-atmosphere close to a great day which saw sets from the likes of Witchsorrow, Furyon and Savage Messiah. It was also amazing to welcome back our Costa Rican chums Sight Of Emptiness, winners of the 2007 Bloodstock Unsigned competition. Sunday’s Sophie offering saw Crimes Of Passion, Demonic Resurrection and Headcharger, among many others, keep everyone’s blood pumping until the sonic holocaust that is Anaal Nathrakh finally blew the roof clean off. No Bloodstock is now complete, of course, without the youth-fueled foundry of metal that is The New Blood Stage, our showcase for emerging talent and the brightest hopes for the future. As ever, we were blown away by the sheer quality of the bands who took part in our annual Metal 2 The Masses campaign, and particularly of those who through sheer tenacity, determination and musicianship bagged coveted slots at the festival. The next generation is growing strong, and we salute you all! All in all, 2012 was another unbelievable year for Bloodstock and for the family of fans, musicians and dedicated volunteers and professionals who give their all to make this festival what it is. Not only did the 2012 UK Festival Awards make Bloodstock winners of ‘Best Festival Under 15,000’, they nominated us for both ‘Promoter of the Year’ and ‘Best Grass Roots Festival’. And so the story continues, the wheel turns and the rock rolls on. By the fans, for the fans, forever!